All information in this application note applies equally to model DI-808 data logger with a built-in Web server, and model DI-2008 Thermocouple, Voltage and Pulse Data Acquisition System. 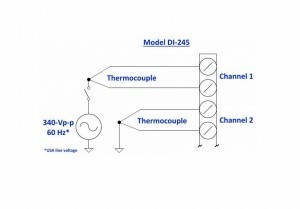 It’s difficult to temper excitement about DATAQ Instruments’ model DI-245 data acquisition system. Beyond thermocouple-based measurements and a superb voltage measurement range, there’s the instrument’s incredible isolation specification. We’ve given you a multimedia presentation and a related post that describes it (see here and here), but this post focuses on an often-overlooked nuance of isolated instruments. Many instruments offer input-to-output isolation and tout that as a great feature. Some isolation is better than none, but it’s important to understand exactly what you get with an instrument that offers only input-to-output isolation: All channels share a common ground that is isolated from power. There are no consequences to this if you connect only one channel to a multi-channel instrument. That single channel’s ground reference is free to float to any value within the isolation spec of the instrument without damage. However, connect a second channel at the same time and you could be headed for major problems. 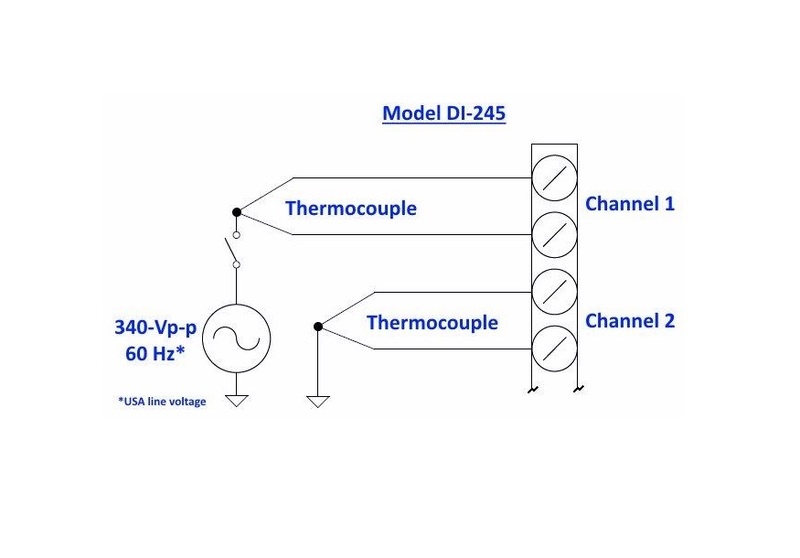 A nearby graphic reproduces the test setup we used in our multimedia presentation where we deployed the DI-245 in a high common mode voltage situation. Can you imagine what would have occurred if the DI-245 supported only input-to-output and no channel-to-channel isolation? Right…instant fireworks. If it isn’t clear why, look closely at the relationship between channels one and two. Channel one has been driven off ground by a 340-V peak-to-peak signal (ordinary US line voltage), while channel two is grounded. If the DI-245 lacked channel-to-channel isolation, meaning all input channels share the same ground, connecting channel two in the manner shown shorts line voltage to ground. Ouch! Fortunately, we anticipated this problem and designed the DI-245 with both input-to-output and channel-to-channel isolation. So, why would any manufacturer design a product with only input-to-output isolation (and there are many who do?) It simply costs less to provide only input-to-output isolation, which translates into a lower selling price while still allowing the company to advertise the product as having isolation. It’s a smokescreen laid in front of a bear trap for customers whose budgets match their instrumentation experience. With the DI-245 you can have it both ways: World-class isolation at a budget-friendly price.